Following is a quick overview of the tweets, comments on some twitter utilities and a look at a non-traditional approach to twitter analysis. An excel version of the archive is available here (includes some additional summary fields) and the live archive can be accessed here (the archive will be left open for a while to get a sense of how long #OERS15 material circulates). 15 – RT @DrJeanforkids: #oers15 john Dewey said “We don’t learn from experience, we learn from reflecting on experience ” have we learned that? The visualizations offered by TAGS 6.0 and Neoformix give two very different considerations to twitter activity. 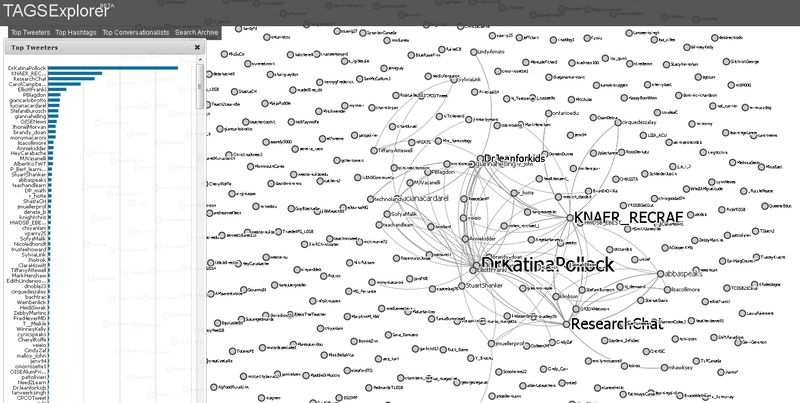 The visualizations in TAGS 6.0 give a cumulative view of twitter activity. The more you tweet over the course of the entire event, the higher you climb on the top tweeters, top hashtags and top conversationalists summaries. However, activity on twitter is not uniform. People do not post 1.6 tweets every minute over the course of the entire event. Instead they post in fits and spurts as topics interest them and as their devices continue to be powered. At OERS one power tweeter was pushed off line when her device ran out of power (which gave the rest of us a brief moment of hope we might catch up). Instead of an entire archive of tweets, the Neoformix Spot application visualizes the last 100 tweets which brings a different perspective to the top tweeters and topics lists. People and topics that might be overshadowed and overlooked in TAGS emerge on the Neoformix list. While the intention of twitter is to share information socially, the introduction of visualizations and ranking lists introduces an element of gaming. In this context, participants “win” solely by volume of tweets. 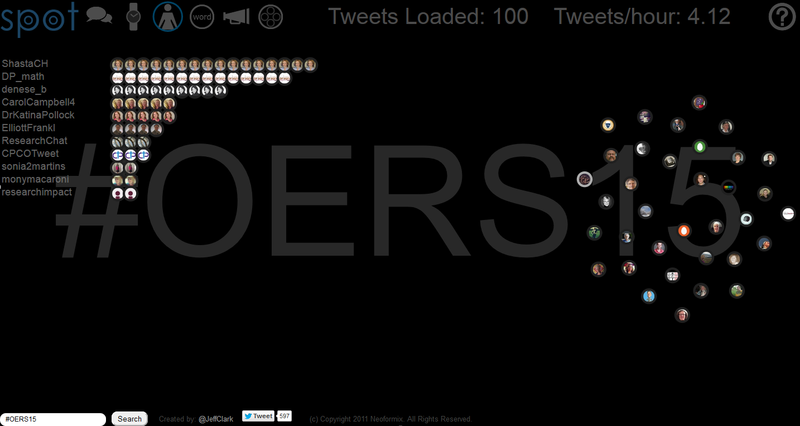 The more you tweet, re-tweet (RT) and modify tweet (MT), the higher you raise through the ranks. However, nowhere in these visualizations does the quality of the information get addressed. @researchimpact tweeted twice, retweeted once and had over 11,000 impressions. To explore the quality of tweets I used an online app developed by Healey and Ramaswamy of NC State University’s “Sentiment Viz – Tweet Sentiment Visualization” http://www.csc.ncsu.edu/faculty/healey/tweet_viz/tweet_app/ . Once visualized, the tweets create a scattergraph give an impression of the emotional content. An example of this graph can be found below which visualizes the tweets (373 tweets) on the last day of the Ontario Education Research Symposium. The dots on the left side that appear to have a negative affect were tweets that were shared during Dr. Shanker’s presentation which addressed the impact of stress on children. 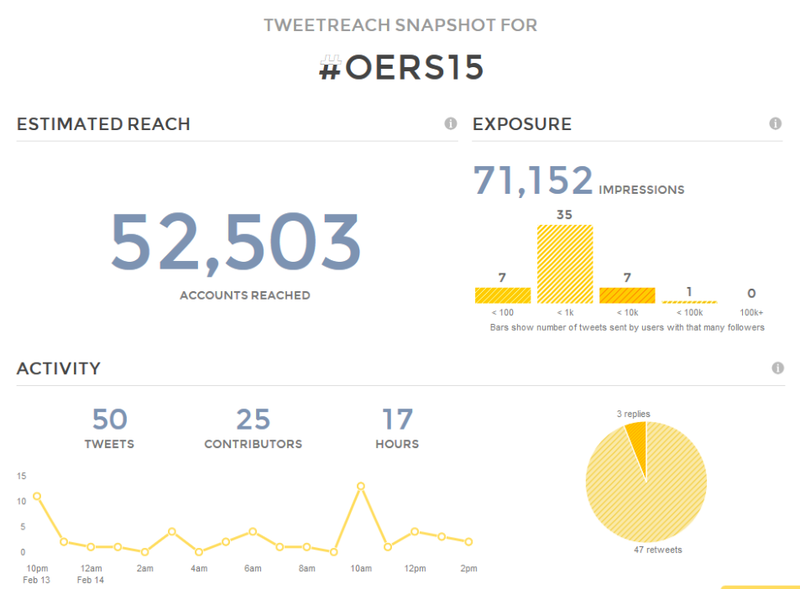 Although OERS 2015 was held in Toronto I have been wondering about the geographic spread of #OERS15 tweets. 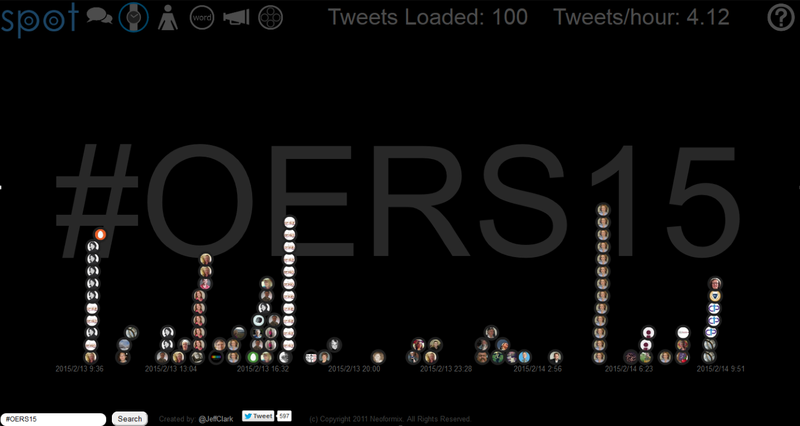 Participants come from across the province to attend OERS but what does the tweet distribution look like and how far do the tweets travel beyond those attending? It would be interesting to create a map showing the geographic distribution of participants that post to #OERS15. There is a utility called TweetsMap (http://tweepsmap.com/) which will create a map of twitter followers but so far I haven’t been able to find anything that begins with a hashtag and ends with a map of those using it. If you know of one, please share it in the comments section. There is a lot of information contained in the tweet archive and I expect that, like the previous years, I will not not have enough time to dig deeper into the content. For those who are passionate about qualitative analysis, active on Twitter and have the time to dig deeper, it would be interesting to see how the tweets relate not just in terms of content but also styles of use: social interaction (invitations for lunch etc. ), note taking (posting points from powerpoint or speaker comments), invitation to discussion (questions to provoke discussion), conversations (responding to the questions), value added material (providing supplemental material to the discussions and resources), and trolling (it’s only logical there would be a few trolling comments). Perhaps there is a teacher or professor with a group of students learning about qualitative analysis that might take this analysis on? If you do, please let me know I’d be interested to learn about your approach, experience and findings. Finally, to the organizers of the 2015 Ontario Education Research Symposium, many thanks for the opportunity to attend and connect. This entry was posted in Data Visualization, Twitter. Bookmark the permalink.